Hancock Street Carriage House is an adorable 1905 carriage house with its own fenced yard and private driveway. Located on a quiet street (to the rear of the main house) it abuts the Breakwater Estate in the heart of downtown Bar Harbor. It's also just a stone's throw from the public access to the historic and scenic Shore Path. 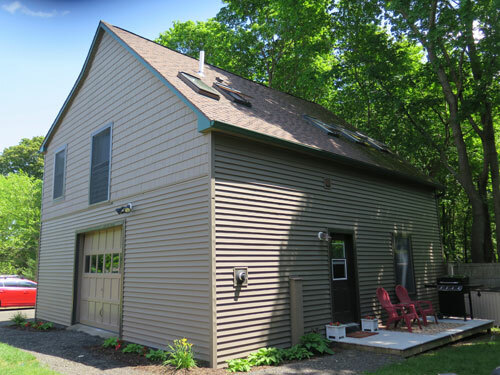 It's an ideal location, nestled in a wooded off-street setting, with lovely accommodations. It's also just steps to all the shops, restaurants and excitement that is Bar Harbor. It is newly renovated for the 2018 season and sleeps 5. When you enter the main level front door, there is a fun sitting area with a twin daybed and fusbol game, giving some added space if kids are in your party! On the 2nd floor there is a king master bedroom and a bedroom with 2 twins beds. There is also a new open-concept kitchen, great room and 3/4 bath and laundry. 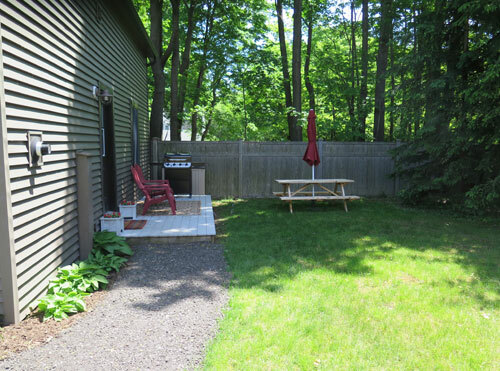 Enjoy the private patio, too, complete with gas grill and an outdoor dining table! Amenities include cable TV (living, masterbedroom), DVD, WIFI, washer/dryer, dishwasher, microwave, gas BBQ, parking for 2 or more cars . Click here for more complete list of household items/amenities. Walk to everything downtown, including shops, restaurants, whale watch tours, sea kayak tours, and much more. 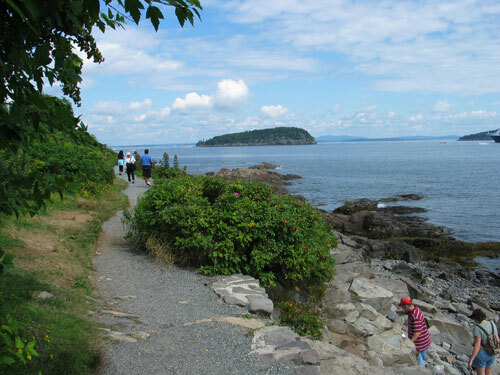 Bar Harbor and Acadia National Park offer visitors a variety of activities, including hiking, biking, boating, lake swimming, carriage road walks, horse back riding, deep sea fishing! Visit the oceanarium, sail on the Margaret Todd, take a Jackson Lab visitors tour, enjoy tea and popovers at the Jordan Pond House, golf at a PGA top-rated course, play tennis. Kids activities include water park, petting zoo, miniature golf, beaches, and lots of ice cream shops!